They began their trip by meeting members of the community at the Cairngorm Hotel, around 40 people (and not forgetting dogs too!) 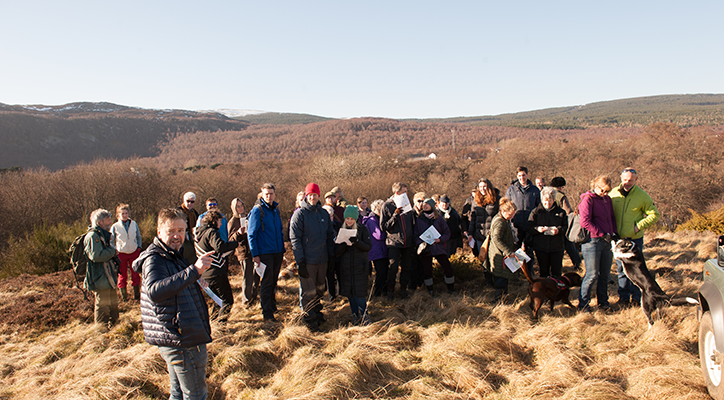 then joined them on a walk of the proposed site at An Camas Mòr. The afternoon was spent back at the hotel where David presented the vision followed by design workshops and discussions around large floor maps. On Monday and Tuesday, David and Louise met with pupils and teachers from Aviemore Primary, Kingussie High and Grantown Grammar. At the primary school pupils were asked what they would like to see on the High Street and using mixed media and reference images the pupils each drew their ideas, including what would be found in the street or along the pavement, at the ground floor, at the first floor and on or in the roofscape. At the end they brought all the individual drawings together to join them up and make a complete street. The High Schools joined together for an assembly to hear the about what Gehl does and where they work and the vision for An Camas Mor. After a quick exercise on ‘favourite places’ around the big map, the pupils spent the morning out in Aviemore using Gehl 12 quality criteria to assess how Aviemore’s public spaces are performing before finishing the day with a screening of Gehl’s film ‘The Human Scale’. On the final day of their trip, David and Louise attended at a business breakfast hosted by Cairngorms Business Partnership where they presented the vision for An Camas Mòr to representatives from local businesses followed a discussion on the future of working and business in the Cairngorms. Sadly the presentation planned for later that day to Kate Forbes MSP and her colleagues at Holyrood had to be postponed because the Parliament building was closed due to the red weather alert. David and Louise had to get off their train and spend two nights stranded in Perth! The parliament meeting has now been rescheduled for June 20th. Now back in Copenhagen, David and Louise have had time to review all the feedback and ideas gathered at their visit and have produced a summary of the community events.